« Cancer! what was I to do? My mother would know. I rang Julie that morning. My heart sank when I heard her voice, it was obvious she was unwell, those sounds when people had a cold Th becomes a DA. I told her about the colonoscopy and the tumour and how much worse cancer was than a cold. I had to sort out my head, my problem was I stopped believing in God in my early teens, after been told by my Granny God would strike me down for misbehaving, I did not behave and he didn’t and I was sent to boarding school. My mother was an atheist, but it was my Granny who brought up my sister Eleanor and I. Granny went to 9 o clock mass every day and my mother left her sort out our relationship with God. In 1960 Granny had been hit by a car and went to Lourdes in France, which she believed healed her and she spent spent the rest of her life thanking Mary and Jesus for the miracle. In her house their were pictures of the “Sacred Heart of Jesus”, Mary the Pope and of course no Irish home was complete without a picture of JF Kennedy. In addition Granny had a saint who could solve every problem. If an animal was sick it was St Francis, If we were traveling St Christopher, as I got older she spent a lot of time chatting to St Jude the Patron saint of “lost causes”. If you lost something it was St Anthony. I was impressed the first time I asked him for help, I was about seven and had lost my catapult. Made from the branch of a tree and elastic bands. Folded paper pellets, could inflict some serious pain on the back of someones neck in class, or my sister and her friends who came to play. Thinking back I wonder if any people were blinded by these weapons. No doubt Granny could have turned to St Lucy the patron saint for the blind if I had inflicted serious damage. Anyway my night prayers to St Anthony were answered and in the morning my catapult appeared on our front lawn. It was a miracle, in fact I witnessed loads of miracles as a child. Nevertheless I soon became disillusioned, prayers did not work very well for my school spellings and as a young teenager praying was absolutely useless for getting girls. So now at 54, I had cancer. St Peregrine is the patron for cancer apparently he had cancer was about to have his foot amputated prayed all night and the cancer was gone in the morning. Now this approach does have appeal however it would only work if I would give up impure thoughts at night. Would I rather be dead than celibate? I would try something else first, before making such a choice. Who else could help me in my hour of need besides the NHS doctors and my mother who had been dead over 20 years? Julie met me about five o’clock that evening we talked for a bit about my irrational fear of dying in the next few months and how I feared I would never laugh again. I hoped she could help. Describing what she says and does will see very strange to many. Hypnotism may not be the solution for everyone, but without a shadow of doubt it has been amazing for me and has helped my through this. Julie would explain what she does better than I can, basically what she got me to close my eyes and think of all the bad things I felt related to the cancer, all these bad are put in an imaginary box, I close the lid and we dump the box. Then we have another box where I pack in all the positive things in my life and things that make me happy. Julie wrote down everything, a list for me to pin on the wall at home; Health, Nutrition, Fresh Water, Love, Laughter, Friendships, Positivity, Staying Calm, Focused, Motivated, Belief, Help, Janette and the children, Courage, Strength, Single mindedness. We had finished the list when and additional item came to me, which seemed particularly relevant, an image of Popeye the Sailor Man eating spinach. In The 60s there was very little children’s TV. In Ireland RTE started at five thirty with a children’s program before the Angelus ( a call to prayer at six in the evening) and that was for the kids. In the summer I was out playing, in the winter you were in and you never missed this half hour. I loved Disney characters like Tom and Jerry, there was Rin Tin Tin, Champion the Wonder Horse, Mr Ed the Talking Horse, Daithi Lacka an Irish version of Donald Duck. However my favourite character was Popeye the Sailor Man, and there seemed something symbolic in the power spinach gave him, now in my hour of need. I knew I needed to make changes to my lifestyle if I was going to adapt to the cancer cells in me, but did I have the discipline. I had had a scare ten years previously and decided then I would change my lifestyle, it lasted like many good intentions a few month. I was too busy had other priorities, not asking myself what could be more important than health? 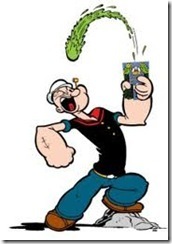 When Popeye is weak and in difficulty he finds the spinach, squeezes the tin into its mouth and he becomes strong and is able to deal with all sorts of adversity, many examples on U tube. Popey was something I could relate to and is easy to focus on. Out of all the thoughts I put in the box Popeye and the kids became the things that helped me move away from the darker thoughts. When I choose Popey, I had no idea whether it would work or not. Writing this now in June 2011 having finished my initial course of chemo and radiation, I can see how successful its been helping me deal with my situation. I have had no side effects and most importantly I have not had any sleepless nights. The first weeks especially before I was given the results of the tests, I thought about Popey every hour. Now its mainly when the kids bring him up, Its fathers day as I write this and Popey features in all the kids wishes for the day. Popey has become a major part of my life and will remain, he makes me smile and reminds me how strong I have become eating my veg every day. The kids and I have decided to convert one of the radiation tattoo markers on my pelvis to an image of Popey when I nam finished treatment. Tagged Cancer, Hypnotherapy, julie sutton, popeye the sailor man, spinach. Bookmark the permalink. 7 Responses to If the mind is not right, the body wont heal. Great to hear from you, its been more than 20 years. Dont think, people change that much, their bodies change and they feel they should behave like their parents. I am glad to say I have not changed and my children and their teachers think I am mad, which probably helps when you are diagnosed with cancer. Will contact you by e-mail. If you can e-mail me asap. Hi how are you? You want to e-mail me? ?